Buffalo Rising slot, like a flurry of Blueprint Gaming editions, makes use of their 'Megaways' License acquired from Big Time Gaming. This results in them being able to release slots based on their uber successful Bonanza game which they have done most memorably with Diamond Mine and Irish Riches. Buffalo Rising adds the one remaining Megaways mechanic variation that we haven't yet seen which we'll discuss soon. As for the rest of it, the theme is North American wildlife and we hear the appropriate tribal music with the reels set over a prairie background similar to Playtech's Buffalo Blitz game with basic mechanic reel sounds as we spin. Can we leave this wilderness with our bankroll intact, or will those buffalo soon trample it underfoot? As is typical with the Megaways slots we have 6 reels with a scroll of 4 symbols lying above the centre reels 2,3,4,5. The reels can vary each spin in rows of 2-7 icons for the outside ones, and 2-6 for the centre 4. This means we will see anything from 324 to 117,649 ways in play on any given spin and this is handy considering the symbols appear stacked too! Wilds only appear in the top scroll of 4 symbols but scattered Pink Diamonds can appear on any reel, singly. The line pays are the same as Extra Chilli or Diamond Mine with the Buffalo naturally being highest at 50x bet for a full way of six. 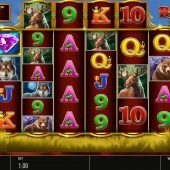 He's followed by the Grizzly Bear at 7.5x, the Wolf or Moose at 2x with six card values decreasing from 1.75 for the A down to 0.8x for the 9. We all know by now that any winning symbols disappear from the reels and are replaced by more cascading down from above. Occasionally you may see an amount of Sunset icons appear and if they do they will all change to reveal a similar symbol which may or may not assist you in getting a pay. If you see 4 Pink Diamonds appear at any time during play, you are awarded 15 free games with an increasing multiplier for each action. 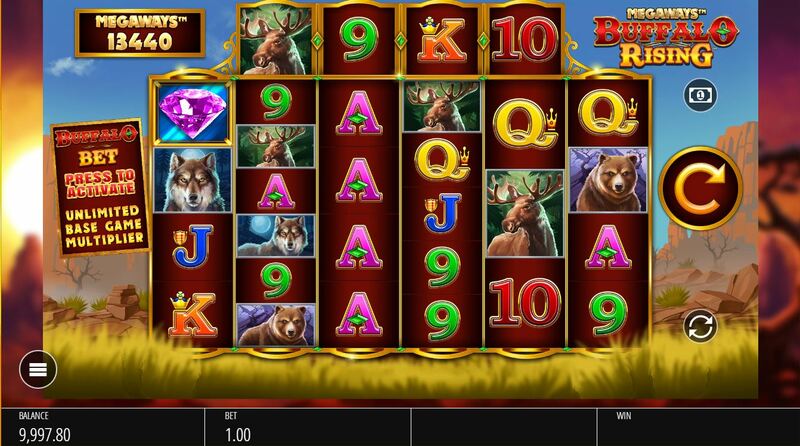 If you get 5 scatters up to the maximum of 8 possible you are given 5 extra spins for each. You may also get 5 or 10 extra spins for 3 or 4 Diamonds respectively appearing only on the top scroll of 4 icons during this bonus. The multiplier is unlimited so when it climbs even multiple ways of low-value icons can yield substantial wins. Rarely, this feature can award thousands times your stake and the long-term average yield is 100x bet. This comes at a cost; the feature occurs on average every 460 spins so savour it when you do land it! There is a feature select here too, as unlike Bonanza you get to choose your free spins model and can opt for 15 spins starting at 1x, 10 beginning at 5x or 5 beginning with 10x. This is the feature I mentioned back at the start and you can pay 5x your chosen stake to activate the increasing multiplier in the base game too, rising by 1x for every consecutive action occurring during a single base game spin. If you trigger a feature in the spin and get some actions afterwards, or land the 4th. scatter after some actions, you start the free games by carrying the triggering multiplier over! Buffalo Rising slot cannot be faulted as it uses BTG's Megaways format which has proven to me the biggest revolution in online slotting in recent years with huge player uptake at casinos. Blueprint have tried to add something different to each of their versions and I'm not sure about the Buffalo Bet for the base game multiplier but the free games options are an interesting choice for the player.